Perhaps it’s because farms are more visible than fishing vessels, or because there are more agricultural towns in America than seafaring communities, but the locavorism that has transformed the farming industry has mostly failed to touch the business of seafood. Farmed salmon, shrimp, and tilapia, all imported great distances, retain their stranglehold on our diets, and while there are hundreds, if not thousands, of Community-Supported Agriculture arrangements in this country, the sum total of Community-Supported Fisheries can be counted on fingers and toes. Most people seem to care more about where their tomatoes come from than where their swordfish does, and I think that needs to be rectified. Which is why I drive, under cover of darkness one Friday morning, through pine barrens and potato fields, to the North Fork of Long Island. My headlights catch a small white sign adorned with a hand-painted bluefish, and I swing into the driveway of Phil Karlin, one of Long Island’s longest-tenured farmer-fishermen and the owner of PE and DD Seafood. When I step out of my car the early summer air is ripe with horse manure and dead fish; across the dark yard I hear the talons of restless chickens scratching against wooden floors. Karlin emerges from behind his truck, a white boxy thing whose engine is already running. “Benny boy, is that you?” he calls to my silhouette; he strides up and pumps my hand. He’s a short, vigorous man in his early 70’s, dressed in painter’s pants and a light sweatshirt covered in ambiguous stains. Ragged cats curl around our ankles as we load the truck with the heads and guts of yesterday’s catch, destined for the compost pile of a neighboring vineyard. After briefly stopping at the vineyard to unload the carcasses, we head down to the dock at Mattituck, an erstwhile fishing town of about 4,000 souls. Phil Karlin, it turns out, is actually Phil Junior, and his son, Phil III, meets us at the dock. The younger Phil is the recent founder of North Fork Smoked Fish Company, for which he catches bluefish and striped bass on rod-and-reel and smokes them in his own home. Before that, he worked for the National Response Center in Louisiana, helping set booms and skim the oil that bubbled from the Deepwater Horizon blowout –– a far more lucrative job than running his smoked fish company, but he doesn’t miss it. “Nothing like being your own boss,” he says fondly, gulping his coffee. We tow the net behind the boat for fifteen minutes and then winch it up. As the net rises from the Sound we see fluke, their brown backs gleaming in the early light, flapping in the mesh. The winch cranks the belly of the net on board and we rush to the bulging bag to ease it open, and its contents spill out across the deck for our perusal. 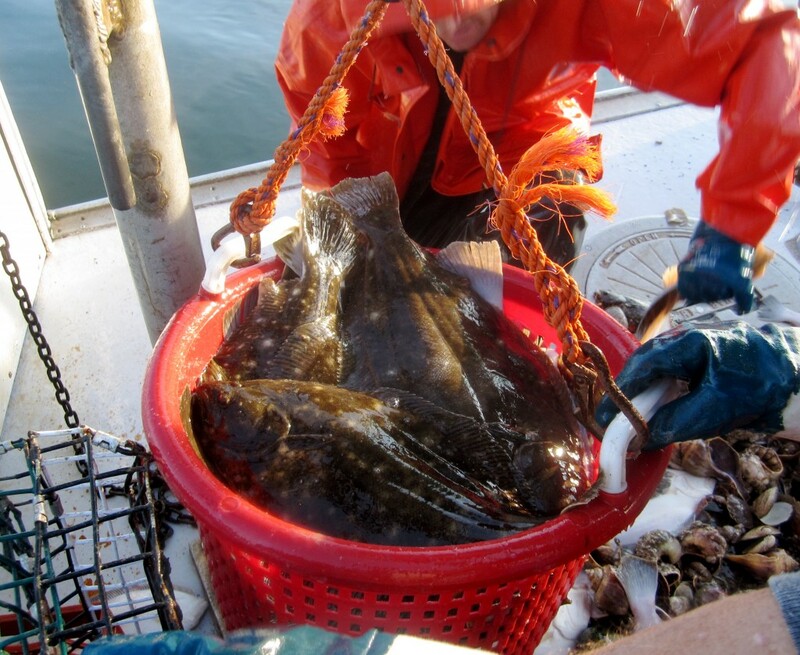 It’s a good haul –– plenty of lively fluke, broader than dinner plates, and about as flat. 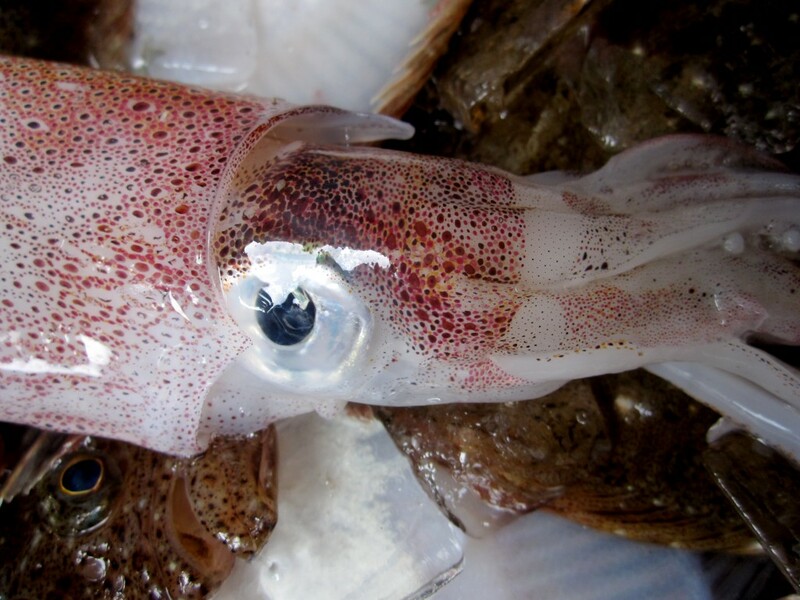 Along with the targeted species, the trawl deposits a panoply of other creatures onto the deck: two silvery striped bass; one black sea bass; a few fat porgies; a small delicate flatfish called a daylight flounder; and goggle-eyed, rust-colored sea robins, their winglike pectoral fins splayed wide. At least half a dozen species of crabs clamber around the deck, picking their way through the empty shells of moon snails and whelks that litter the floor of the boat. “Go time, Bugsy!” yells the oldest Phil –– for reasons known only to him, he’s decided to call me Bugsy. 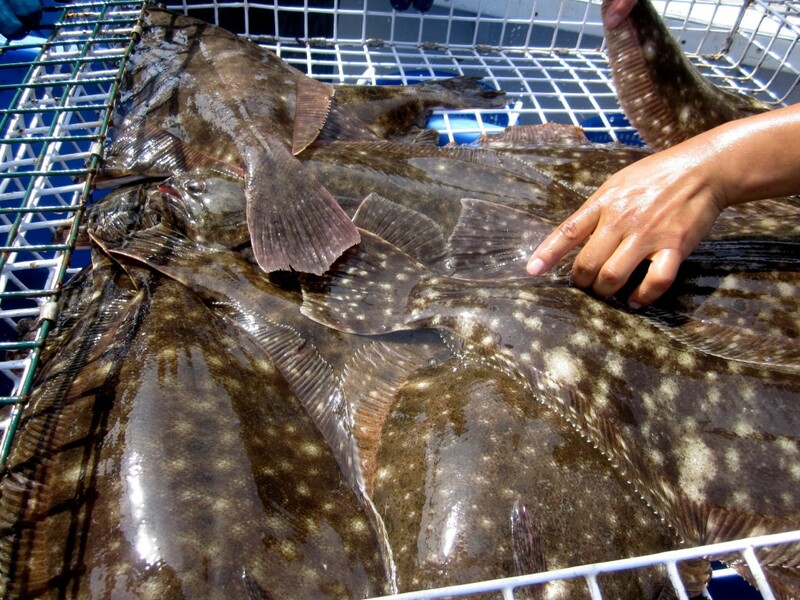 “Grab those fluke! Grab ‘em! Two hands, two hands!” I scramble around the deck in pursuit of the flapping fish, whose irregular shape makes them almost impossible to grasp. They slide through my fingers and slap wetly against the floor. The net, hanging from the winch above us, splatters my exposed head with seawater and dollops of vegetation. All around me is writhing, slippery chaos, the sea’s mysteries unveiled and strewn across our feet, gasping creatures somersaulting back toward the Sound from whence they came. I turn my attention back to the writhing mass of fluke, no less vigorous for having been out of the water for several minutes. I finally corral a fish and coax it into a red bucket with a few of its unlucky friends. Fluke that measure below 14 inches go back into the sea, and make a beeline for the benthos from whence they came. Soon all the keeper-sized fish are in the red bucket. We then transfer the fluke into a gigantic wooden box filled with seawater, an ad hoc live well designed to keep our catch vivacious for the rest of the trip. Fluke delivered alive and kicking to the dock are worth twice as much as dead ones. 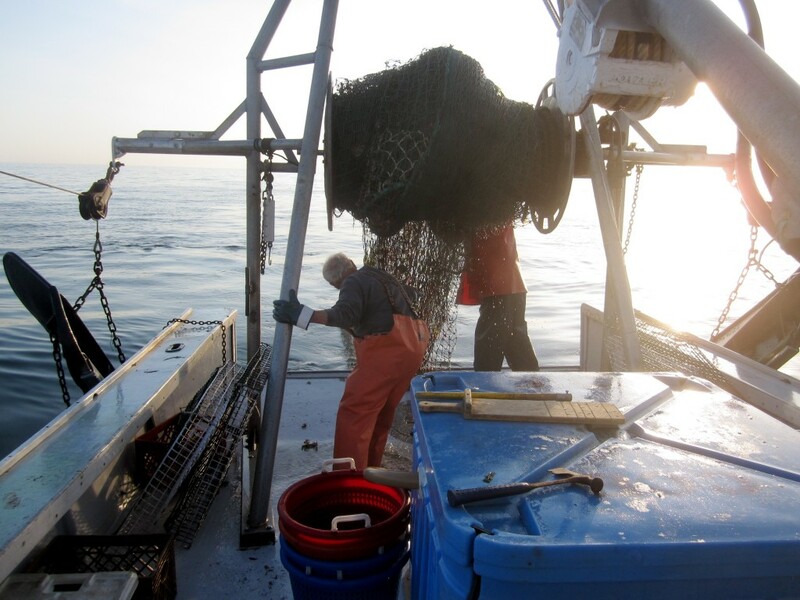 After the net itself, the live well is one of the most important pieces of equipment Phil Karlin has on board. Once the fluke are stacked like unhappy flapjacks in the live well, we turn our attention to the other species still squirming on the deck. The black sea bass and the bluefish will both yield great filets –– many people claim not to like bluefish, finding it too, well, fishy; but I think it’s delicious. The spherical moon snails and the twisting whelks all wind up in a bucket of their own, destined for Asian supermarkets in New York. 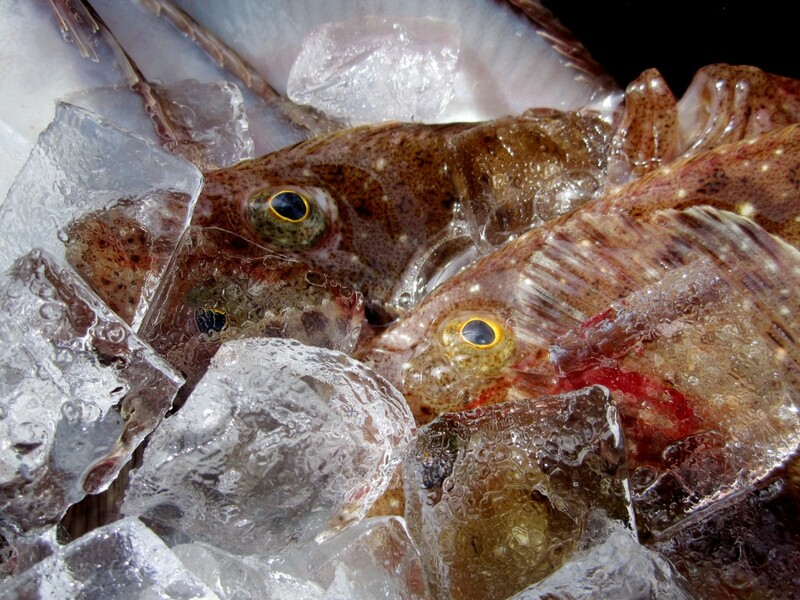 The sea robins –– huge-eyed, splay-finned, whisker-chinned, freakish in every way –– are packed into another crate and entombed beneath ice. I’ve never eaten sea robin, and they have a reputation as a trash fish, a perception furthered by their strange appearance; but their stout bodies reportedly contain tasty meat, and they’re a staple of bouillabaisse. And sure enough, Phil knows a French chef at a local hotel who makes the dish, and is happy to take the odd creatures off his hands. Everything else that has come aboard –– the hundreds of empty, slime-furred shells, the skates, the uncountable spider crabs, hermit crabs, blue crabs, and green crabs whose legions spread across the deck on jointed legs –– is swept back into the ocean with a push-broom, leaving behind a dark streak of muck and a few doggedly clinging crabs that fail to realize it’s time to go home. We make four more hauls of the net, none quite as successful as the first, and then Phil Senior decides to call it a day. It is not yet noon. The live well is crammed to the sloshing brim with fluke. Nearly every living thing we extracted from the sea is either destined for the dinner table or has been returned, alive, to its domain. A handful of spider crabs, crushed underfoot during the scramble to round up the fluke, are the sum total of the collateral damage. But that’s the ocean-half-empty perspective –– and on the other hand, shouldn’t we be heartened by the fact that there are still, even after all these decades of relentless extraction, a million pounds of fluke to haul up? How many of the species must remain, and how rapidly must they reproduce, that their population can sustain this fishery? Despite all the damage we’ve inflicted upon them, the seas in New York City’s backyard remain fecund, and that should be cause to celebrate. Conservationists, of which I am undeniably one, are fond of wringing their hands over the state of the world’s fisheries, and there’s plenty of reason to hand-wring. As many as 90% of the planet’s large predatory fish have vanished, and, depending on whose research you believe, somewhere between 10% of 30% of fish stocks have collapsed entirely. 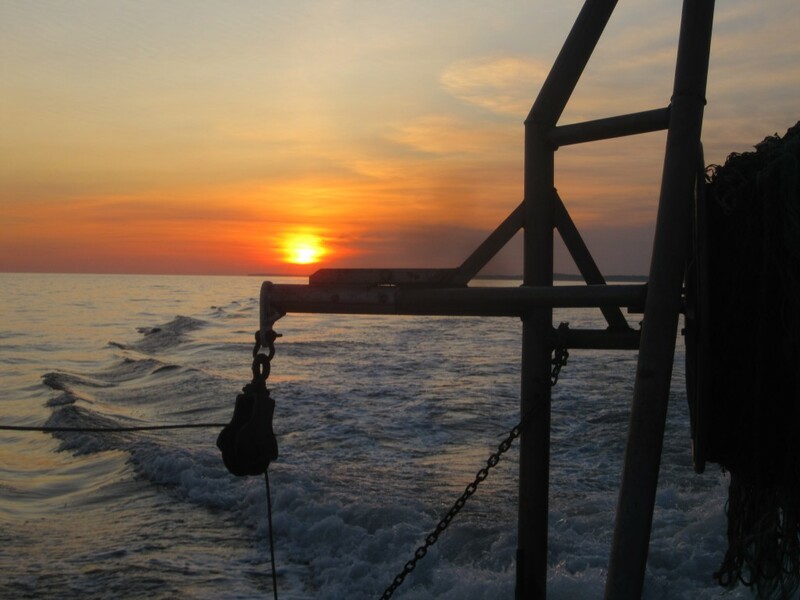 But the outlook for American fisheries may not be so grim –– in a New York Times op-ed last year, fisheries biologist Ray Hilborn made the case that most of the nation’s fish stocks are recovering, nursed back to health by strong legislation and sensible management. The striped bass that we caught, for instance, were the beneficiaries of a moratorium on fishing passed in the 1980’s, a drastic measure that transformed one of the country’s most imperiled populations into one of its most robust. Not only is the proliferation of industrial fishing vessels bad news for employment, it’s also bad news for the fish. 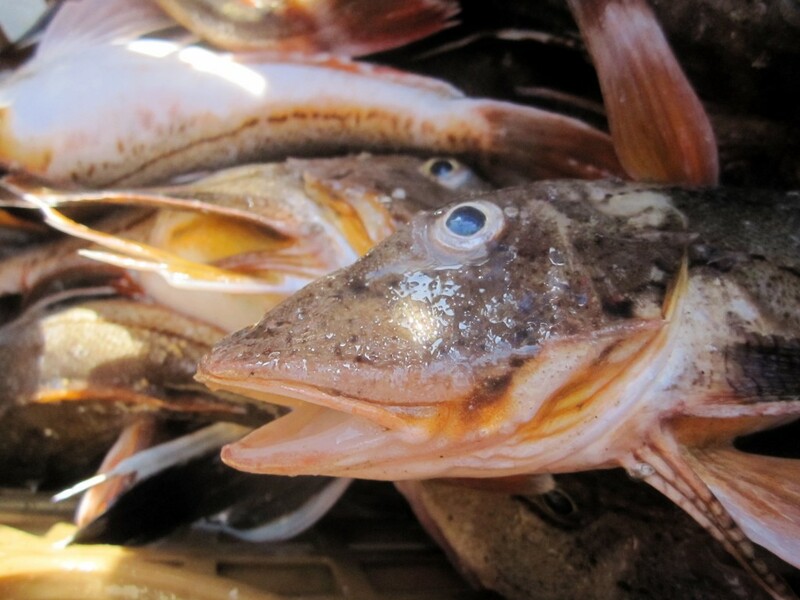 Industrial fisheries have far higher rates of bycatch than small-scale, artisanal fishermen. The reasons for the discrepancy were obvious during my short trip with Phil Karlin. Industrial boats tow their nets for hours at a time, engulfing tens of thousands, if not millions, of fish –– many of which die in the net, crushed by sheer biomass pressed into such close quarters. Smaller boats, on the other hand, drag their nets for much shorter intervals –– Phil’s longest tow was only twenty minutes, ensuring that everything that came up in the net was still alive and capable of being released. And because smaller operations deal with only hundreds of organisms at a time, instead of hundreds of thousands, it’s far easier to pick out non-target species and immediately return them to the water. Phil couldn’t miss those two glistening striped bass atop his modest pile of fluke; but if the bass had been buried beneath a mountain of fluke, it’s doubtful that they could have been saved. Finally, small-scale fishermen are often more connected to local markets, allowing them to find outlets for species that many dismiss as “trash fish.” Industrial boats have the luxury of singling out one species and relentlessly pursuing it: even if anchovies fetch less than a dollar a pound, catching a million pounds of anchovies will still allow a seafood company to turn a profit. But because fishermen like Phil can’t catch more than a few hundred pounds of anything, it behooves them to seek out all available markets –– even if that market is just a single French chef at a single hotel looking for a batch of sea robins for his bouillabaisse. 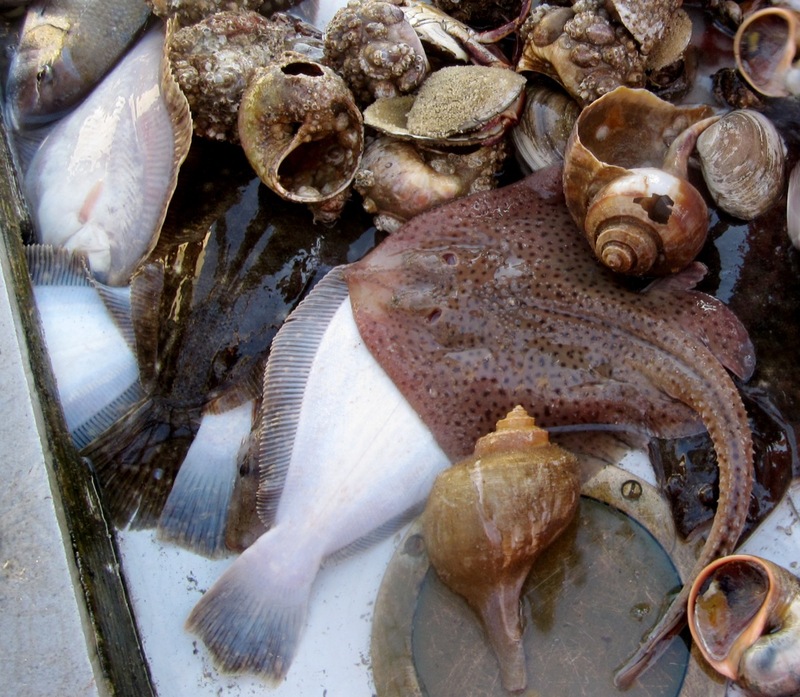 If those sea robins had been caught by an industrial boat, the transaction never would have happened; instead, the robins would likely have been killed and wasted. Two ospreys leap from their enormous aerie as we approach the dock, flashing their snowy plumage. A man named Kim, who operates a seafood distributorship and speaks little English, awaits us; he rummages through the still-living fluke in search of the healthiest specimens, which he tosses into another live well in the belly of his truck. “Pretty nice, huh?” Phil says to Kim, who smiles cryptically, scrawls a number in pencil onto a sheet of paper, and departs. Back at Phil’s property, we offload the day’s catch. Unlike most fishermen, Phil owns a small plant that allows him to process and sell his own catch, a capacity that has helped keep him in business all these years. The processing plant is staffed by Phil’s immediate family –– another son, as well as a grandson –– and close friends; his wife runs the small store attached to the plant, which offers filets and fish salads. They won’t let me leave without taking a few pounds of fluke, and after a brief protest I acquiesce, fish tacos on my mind. “You’d better come back now, Bugsy,” Phil chides me as he holds the gate open. For sure, I tell him –– I wouldn’t miss striped bass season for anything.